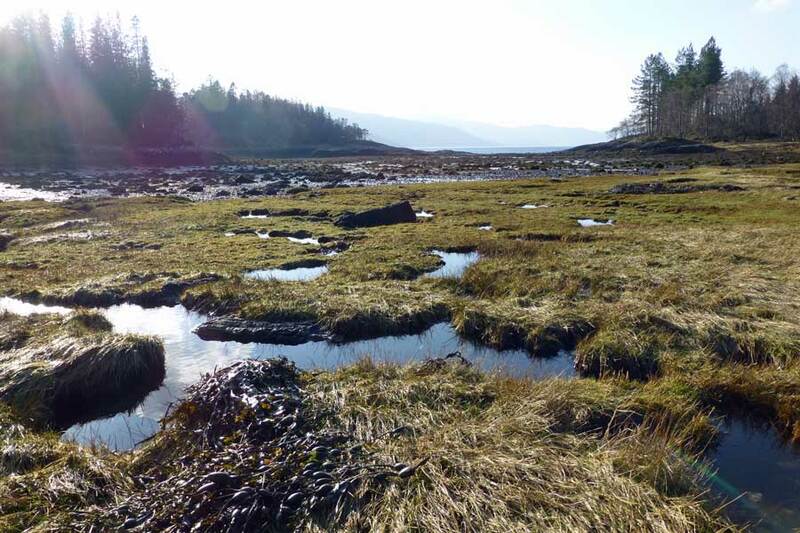 The Bay of Flies, near Salen in the Ardnamurchan is a natural harbour formerly used to export goods, such as charcoal, oak bark and brushwood. The Viking's were also reputed to have stored their boats over winter in the harbour. 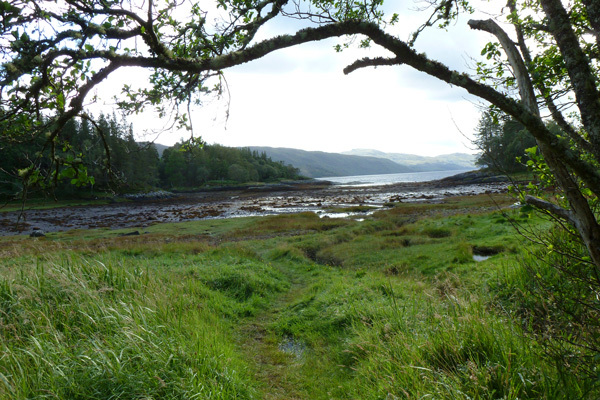 The short, circular walk descends along a well-defined path through native oak woodland to the bay on Loch Sunart. There are some interesting wooden sculptures on route. At low tide, it is possible to explore the beach and rocky outcrops; a good place to spot otters, seals, coastal birds and diving ducks. Listen out for a range of woodland birds in Spring and Summer, including wood warblers, redstarts and flycatchers, as well as the evocative calls of the male cuckoo in Spring. 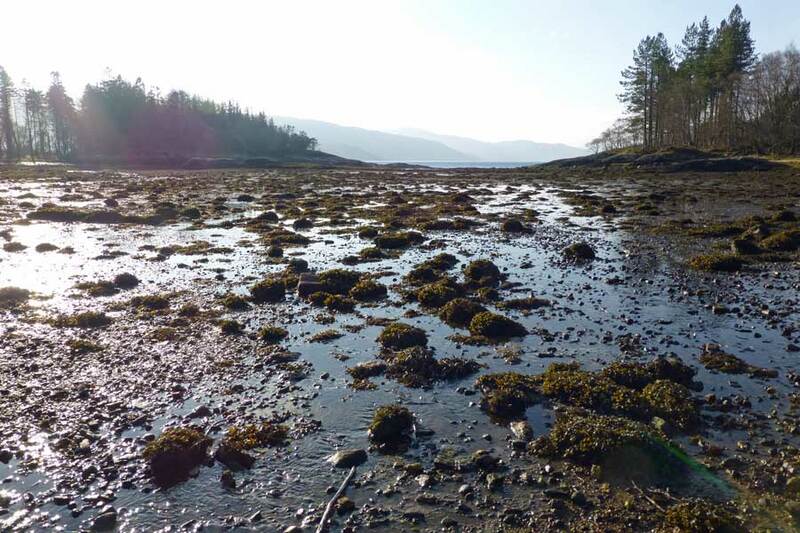 At the shore, there are lovely views across Loch Sunart to the wooded shoreline of Glencripesdale, is an international renowned site for its bryophytes (mosses, liverworts and hornworts) associated with its Atlantic oak woodlands. 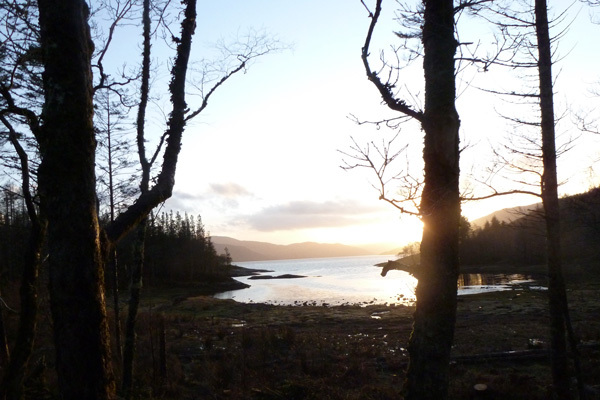 The beautiful, rugged coastline of the far shore of Loch Sunart and its shimmering water is mesmeric in fine weather. 1. Park at the car park off the A861, about 1km east of Salen, in the Ardnamurchan. 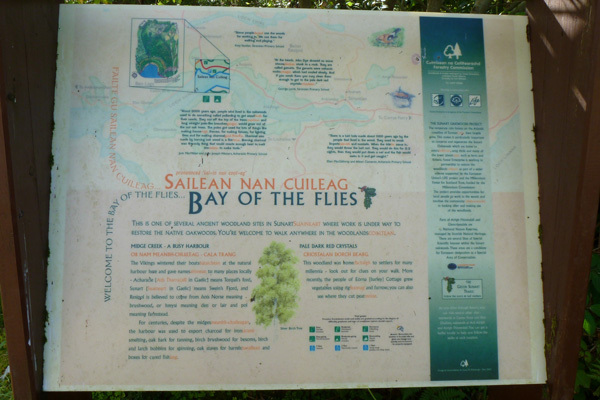 There is an interesting interpretation board explaining the history and use of this natural harbour in the car park board at the start of the short walk. Take the gravel path heading through heath/birch woodland, passing by a picnic bench on your right. Beyond the picnic bench, the path starts to descend rather steeply into birch woods, with scattered mature oaks and luxuriant patches of greater woodrush (Luzula sylvatica). 2. 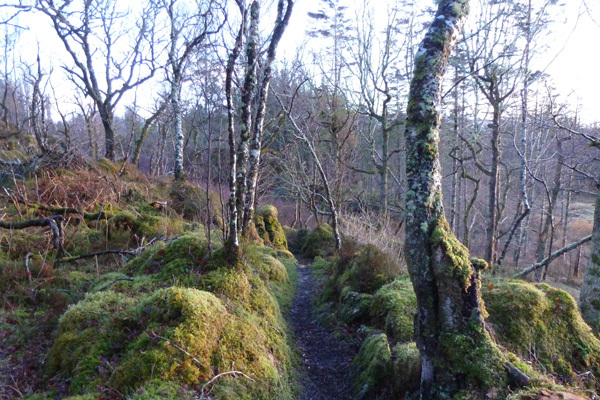 Turn left at the T-junction and ascend into mature oak woodland with Vaccinum myrtillus and Calluna understory, interspersed with rowan (Sorbus aucuparia) (good for Graphidion lichens) and holly (Ilex aquifolium). There is also abundance of bryophytes on route. The path soon begins a steep, mainly stepped, descent to the shoreline, which is fringed with an exuberance of yellow flag iris (Iris pseudacorus) in Spring and Summer. 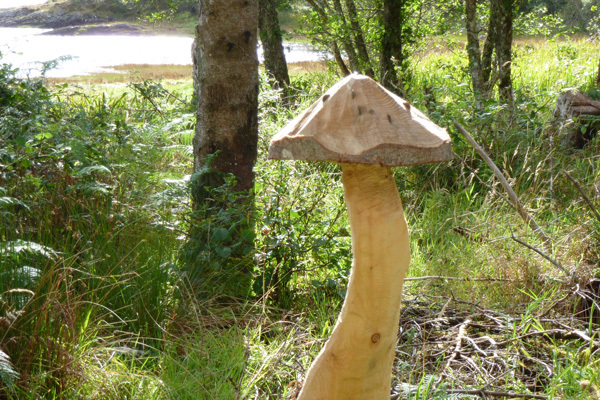 At the coastal edge, there are also some interesting wooden sculptures, carved from the stumps of coniferous trees. The path skirts around the edge of the shore before heading back into the woodlands. 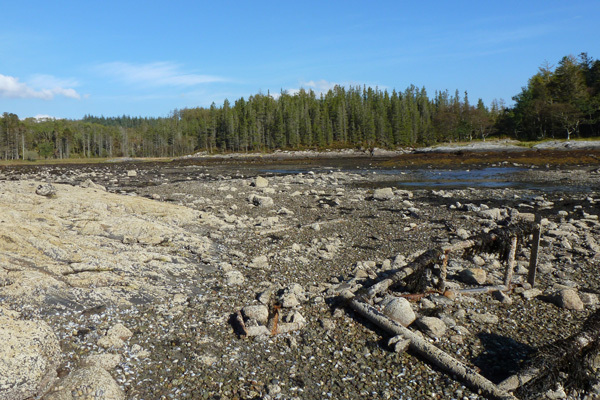 At low tide, it is well worth exploring the coast, following a grassy path onto the shore and across the small salt marsh, patterned with innumerable small, irregular shaped pools and dendritic channels, and then onto the shingle/shell beach. The salt marsh is awash with the pinkish hues of flowering thrift (Armeria maritima) in Spring and Summer. 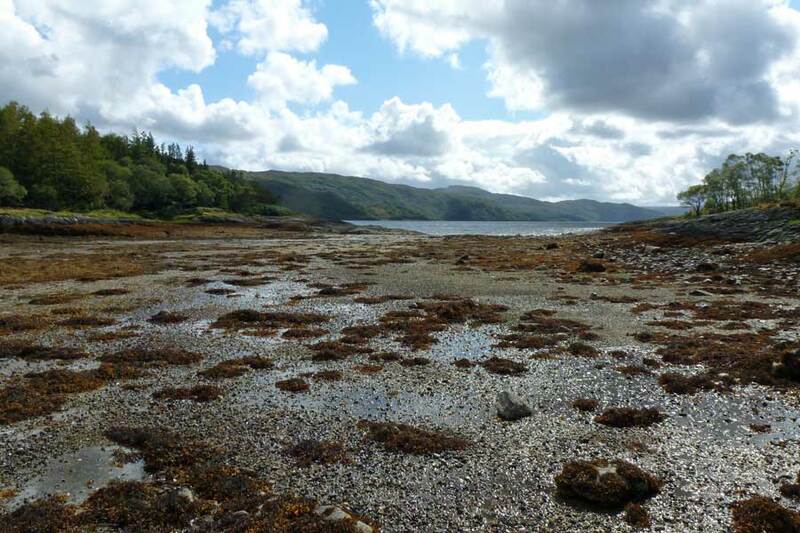 The exposed shore is dotted with stratified clumps of brown seaweeds (fucoids, Pelvetia canaliculata and Ascophyllum nodosum) at low tide. The rocky shoreline also supports an abundance of barnacles and clusters of mussels, with scattered limpets, dog whelks, top shells etc; a good place for a rocky shore safari. 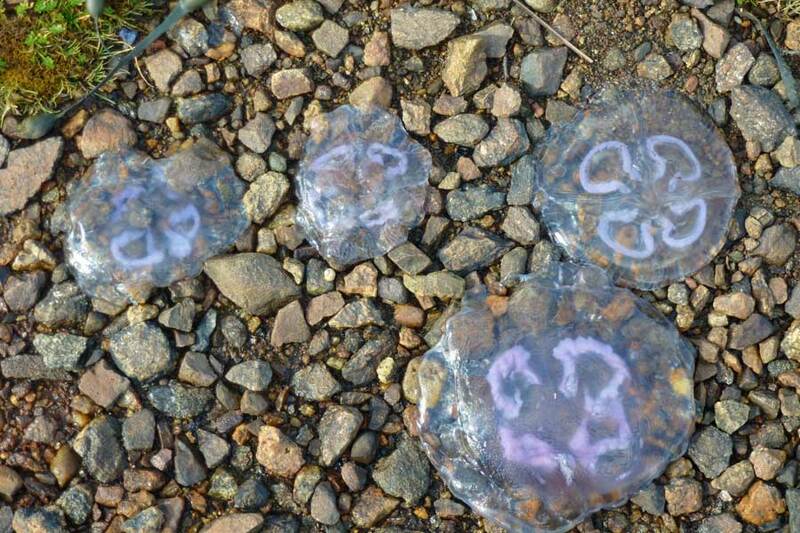 Look out for otters fishing in the fucoids/kelp beds and coastal birds and diving ducks on the shore and open water. 3. 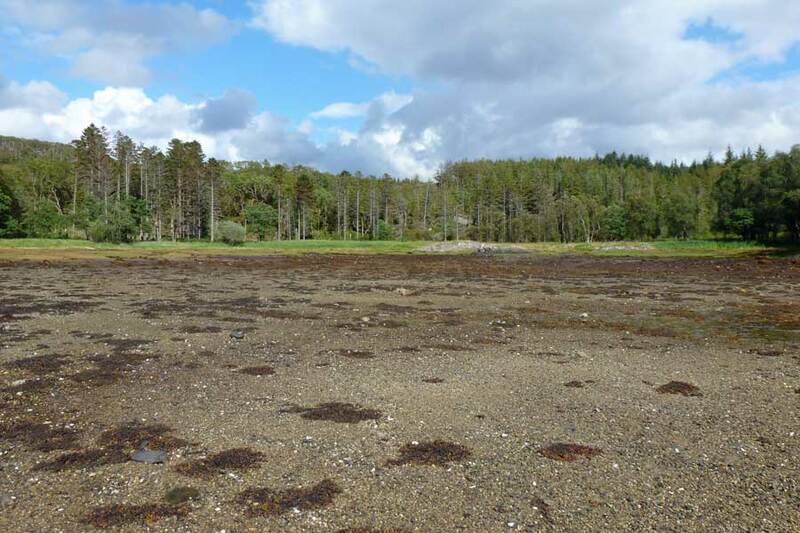 After exploring the beach return to the coastal path by the same route and continue on, ascending through the birch/oak woodlands and crossing a small stream with stepping stones. Turn left at the T junction and head back to the car park.